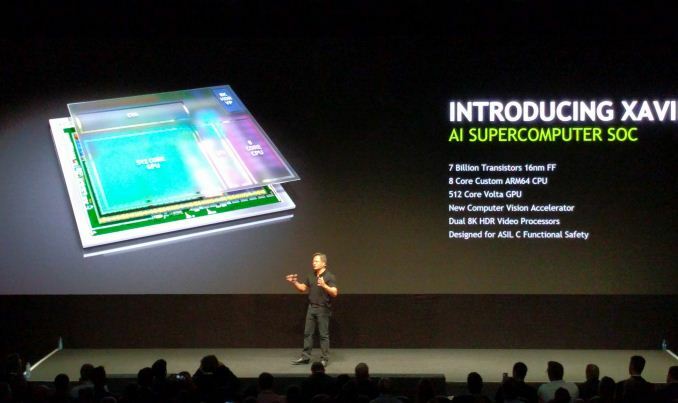 Ever since NVIDIA bowed out of the highly competitive (and high pressure) market for mobile ARM SoCs, there has been quite a bit of speculation over what would happen with NVIDIA’s SoC business. 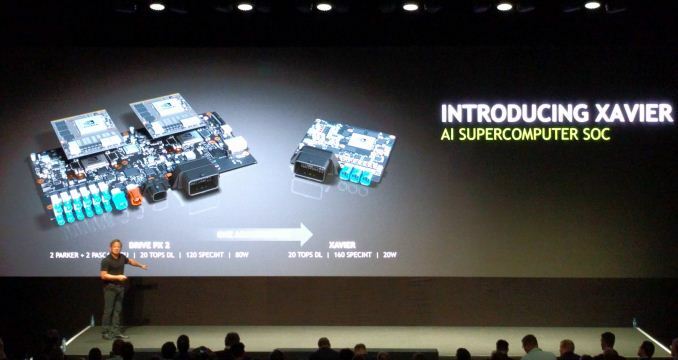 With the company enjoying a good degree of success with projects like the Drive system and Jetson, signs have pointed towards NVIDIA continuing their SoC efforts. But in what direction they would go remained a mystery, as the public roadmap ended with the current-generation Parker SoC. However we finally have an answer to that, and the answer is Xavier. At NVIDIA’s GTC Europe 2016 conference this morning, the company has teased just a bit of information on the next generation Tegra SoC, which the company is calling Xavier (ed: in keeping with comic book codenames, this is Professor Xavier of the X-Men). Details on the chip are light – the chip won’t even sample until over a year from now – but NVIDIA has laid out just enough information to make it clear that the Tegra group has left mobile behind for good, and now the company is focused on high performance SoCs for cars and other devices further up the power/performance spectrum. Under the hood NVIDIA has revealed just a bit of information of what to expect. The CPU will be composed of 8 custom ARM cores. The name “Denver” wasn’t used in this presentation, so at this point it’s anyone’s guess whether this is Denver 3 or another new design altogether. Meanwhile on the GPU side, we’ll be looking at a Volta-generation design with 512 CUDA Cores. Unfortunately we don’t know anything substantial about Volta at this time; the architecture was bumped further down NVIDIA’s previous roadmaps for Pascal, and as Pascal just launched in the last few months, NVIDIA hasn’t said anything further about it. Meanwhile NVIDIA’s performance expectations for Xavier are significant. As mentioned before, the company wants to condense much of Drive PX 2 into a single chip. With Xavier, NVIDIA wants to get to 20 Deep Learning Tera-Ops (DL TOPS), which is a metric for measuring 8-bit Integer operations. 20 DL TOPS happens to be what Drive PX 2 can hit, and about 43% of what NVIDIA’s flagship Tesla P40 can offer in a 250W card. And perhaps more surprising still, NVIDIA wants to do this all at 20W, or 1 DL TOPS-per-watt, which is one-quarter of the power consumption of Drive PX 2, a lofty goal given that this is based on the same 16nm process as Pascal and all of the Drive PX 2’s various processors. Wrapping things up, as we mentioned before, Xavier is a far future product for NVIDIA. While the company is teasing it today, the SoC won’t begin sampling until Q4 of 2017, and that in turn implies that volume shipments won’t even be until 2018. But with that said, with their new focus on the automotive market, NVIDIA has shifted from an industry of agile competitors and cut-throat competition, to one where their customers would like as much of a heads up as possible. So these kinds of early announcements are likely going to become par for the course for NVIDIA. Only if they are hooked up to a decent memory system. That has been conspicuously lacking in mobile ARM systems so far. Look at the usual ARM scaling --- 4+4 systems like A57+A53 or A72+A53 get about 3x the throughput of a single core. It's not enough just to have a wider bus, you need more parallelism throughout the memory system, which in turn means you need multiple (at least two) memory controllers, memory buses, and physical memory slivers of silicon. But if there's one thing manufacturers hate, it's adding more pins and more physical slivers of silicon. So I fully expect this to be as crippled as all its predecessors, able to run those three cores for a mighty 3x throughput compared to one core. Volta is their first microarchitecture to be built from the ground up for 16nm so it's likely to have even wider optimization over Pascal than Pascal had over Maxwell.